Ertugrul Osman - the would-be sultan known in Turkey as the "last Ottoman" - has died in Istanbul at the age of 97. Osman would have been sultan of the Ottoman Empire had Turkey's modern republic not been created in the 1920s. He was a 12-year-old at school in Vienna when he heard the news that his family was being expelled by Mustafa Kemal Ataturk, the soldier who founded the modern Turkish republic out of the ashes of the old empire. 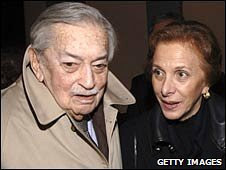 Osman eventually settled in New York, where for more than 60 years he lived in a flat above a restaurant. Always insisting he had no political ambition, he only returned to Turkey in the early 1990s at the invitation of the government. During the visit, he went to Dolmabahce - the palace by the Bosphorus where he had played as a child. Characteristically, he joined a tour group in order to avoid any red-carpet treatment. Ertugrul Osman is survived by his wife, Zeynep, a relative of the last king of Afghanistan.